Team check-in will run from 4:00-7:00 PM local time Thursday, January 25th before the tournament. Sites of meetings will be at the Convention Center. All formats and seeding will be as designated by the YJND Competition Committee.There will be no coaches meeting, during check-in must you provide a signed roster, Thursday night 4-7, or prior to your first match. No bracelets. The Dallas Convention Center parking lots will be charging for parking, rates will vary. If you have any questions regarding this tournament, please contact Andy Reitinger. AVC Dallas 18’s National Qualifier will be using Advanced Event Systems for its registration process. AES will be the website that is the choice of USA JNC Girls Championship, many other qualifiers (including AVC Dallas 18’s National Qualifier ) and regional tournaments around the nation for registering teams. Go to Advanced Event Systems to register your team and club. Click on Add Club if you are a new user. If you already have a password and username, skip to step 4. If not, fill out the club info and hit the submit button. Next, fill out the Club Director info, creating a username and password and making sure to keep your username and password in an accessible spot for future use. Enter your username and password and login. Click on Staff, then “Add New Staff.” Enter the information, and hit the submit button. Click on Players, then “Add New Players.” Enter the information, and hit the submit button. Repeat for all players. Click on Teams from the list on the left. Click on Add New Teams, enter info, and submit information. Click on your new team, and then on “Add/Update Staff.” Click on “Add New Staff” and choose from the pull-down list the available names and hit submit. Go back to “Teams,” click on the selected team, and then on “Add/Update Team Players.” Choose from the pull-down list of available names and hit submit. Continue until all team players are added. 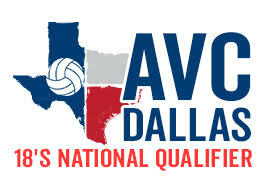 Click on “Enter Events.” Hit the “Register” button for AVC Dallas 18’s National Qualifier that you want to play. Make sure you update your results under the results section! Contact AES Housing at (855) 216-4444 for rooms to ensure that you meet the Stay to Play requirement of 5 room nights per team. AVC Dallas 18’s National Qualifier staff will send out emails to inform you of other information and steps as they come available. The date that the completed entry application is received by the Qualifier. This includes being registered on AES, payment being received by Summit Tournaments, and the housing requirement being fulfilled on AES (This INCLUDES having individual rooms picked up within the block and attributed to appropriate teams). Teams are cautioned about making non-refundable travel plans prior to the acceptance date. Teams are, however, encouraged to make housing plans early. All teams should be prepared to play at 8 am local time on Friday, January 26th. Actual start times will be communicated after the entry deadline. All competition is projected to be completed by 4:00 PM on the final day. Team check-in will run from 4:00-7:00 PM local time Thursday, January 25th before the tournament. Sites of meetings will be at the Convention Center. All formats and seeding will be as designated by the YJND Competition Committee. There will be no coaches meeting, during check-in must you provide a signed roster, Thursday night 4-7, or prior to your first match. No bracelets. Up referees will be supplied for all matches. Teams will be required to supply down referees, line judges, and scorekeepers. As in the case with the Junior National Championships, everyone listed on a roster as a coach is required to be IMPACT level certified. To obtain information on becoming IMPACT certified, contact the junior rep of your region. This year AVC Dallas 18’s National Qualifier will be charging an entry fee for all non-players and non-coaches. Tickets can be bought Thursday – Sunday at the rate of $15 Tournament Pass. We will start selling bracelets on Thursday from 4:00 pm – 8:30 pm. Admission will then again be open at 7:00 am on Friday. “Lost” bracelets will not be replaced. We will replace damaged bracelets if needed. There will be security guards at the entrance and each hall, and you will need to have the bracelet on your wrist to enter.